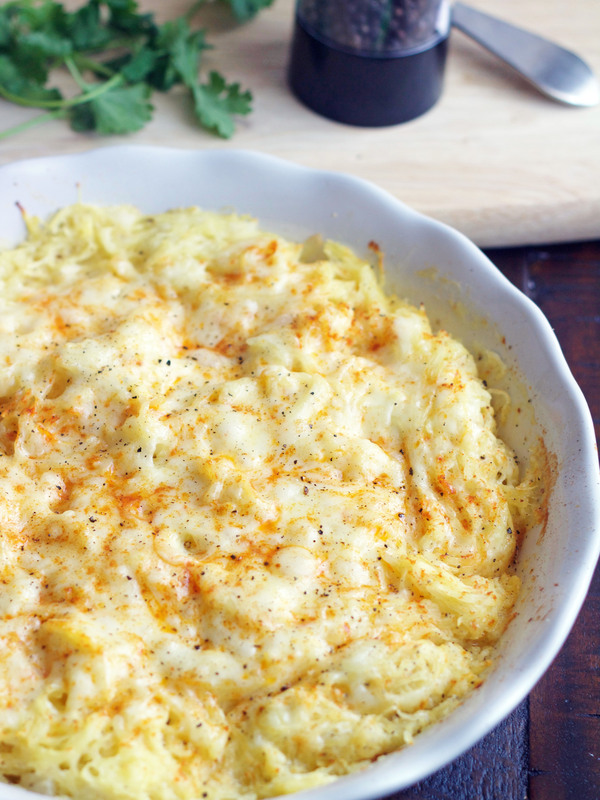 This Spaghetti Squash Monterey is absolutely delicious and an impressive side dish for any meal. So simple to make and hard to resist. It’s one of my favorite ways to eat spaghetti squash. I have been making this Spaghetti Squash Monterey for several years now and I realized the other day I have never shared the recipe. Ummm, pretty darn selfish of me, right? It’s one of my most favorite ways ever to eat spaghetti squash. I could eat the entire dish and make it my meal. I’m so sorry I’ve been holding out on you guys, please forgive me. I’ve made this for numerous dinner parties and it always gets rave reviews. Spaghetti squash is probably my most favorite squash and I love that every summer my spaghetti squash plant goes gangbusters. The great thing about a squash like this is that it’s super hardy so even when the weather starts to turn cooler, my spaghetti squash live on in my garden and keep growing and ripening while my poor tomatoes seem to succumb to the dang cooler temps. I love to use spaghetti squash in place of pasta. A big plate of spaghetti squash strands with spaghetti sauce poured over the top then sprinkled with Parmesan cheese makes me so happy. 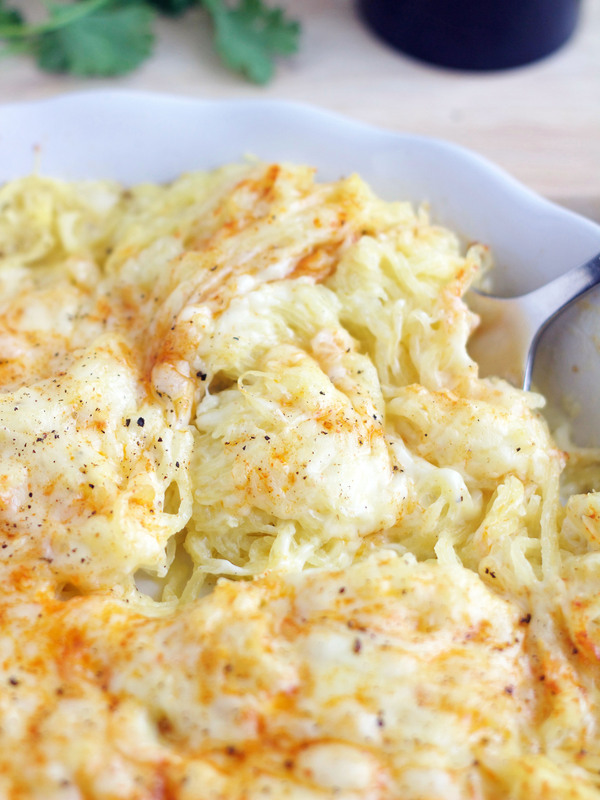 This dish is the perfect, simple side dish and I’m pretty sure if you’re a fan of spaghetti squash, you’re going to fall in love with this. I’ve made a few modifications over the years from the original recipe and I think it’s just perfect. The original recipe called for a full onion, but to me, the onion was just too overpowering so I cut it back quite a bit. If you love a really strong onion flavor, then you can increase the amount of onion. If you do that, just increase the butter by a couple tablespoons. I always cook my squash in the microwave, but you can also cook your squash in your oven. Place it cut-side down on a lightly greased baking sheet and bake it at 350 degrees until tender when the flesh is pierced with a fork, about 40 minutes. I love to sprinkle the top with smoked paprika, but regular paprika is fine. A simple, delicious side dish. 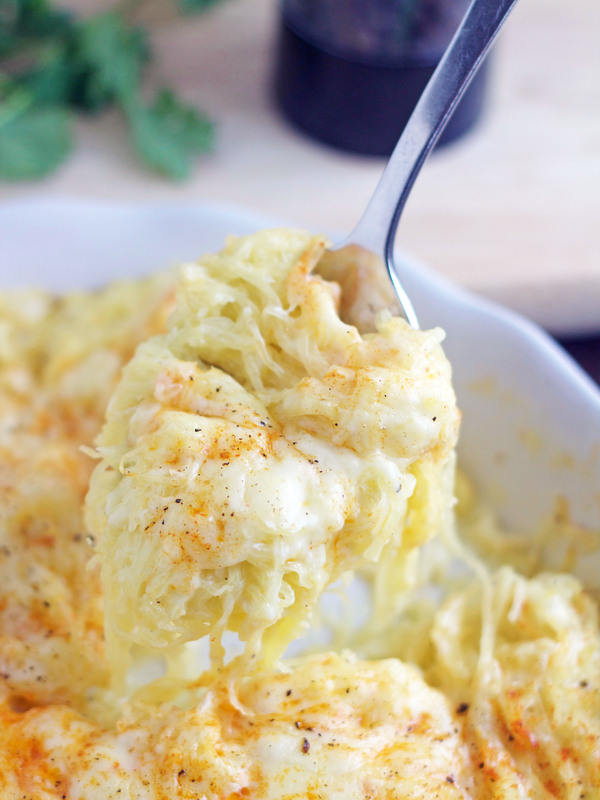 Strands of spaghetti squash with sour cream, grated cheese and sauted onion. Sooo good! Cut the squash in half lengthwise and remove the seeds. Place face down in a microwave safe dish and put about about 1/4 inch of water in the dish. Cover with wax paper and microwave until squash is tender (about 14 to 16 minutes). Let cool for about 5 minutes and then using a fork, remove the strands of squash and put into a medium bowl, set aside. While squash is cooking, melt butter in a small skillet and add onion. Saute until onion is soft and transparent. 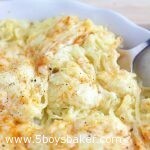 To the cooked squash, add cooked onion, sour cream, salt, pepper and 1 cup of the grated cheese. Mix well and scoop into a buttered casserole dish or large pie plate. Sprinkle with remaining cheese and paprika. Yum! I am putting this on my “to make” list! I usually put spaghetti sauce on mine but will definitely try this recipe. Thanks for posting.